Not only is Vietnamese food delicious, but it is also really healthy. With antioxidants that delay ageing. Vietnamese salads and soups are full of Vitamins E and A, thanks to fresh herbs, spices, plenty of veg and lean protein. Vitamin E works to fight free radicals in your body (one of the major causes of pre mature ageing) and Vitamin A is essential for healing scrapes and scars, and keeping wrinkles at bay. With a loads of your daily Vitamins and minerals, in one bowl. Authentic Vietnamese stocks take 10+ hours to prepare, and are a great source of 10 of your vitamins and minerals including vitamins C, B3, B6, folate, iron and magnesium – nutrients which all contribute to the reduction of tiredness. Vietnamese salads stack up as well: The Prawn Papaya Salad at Pho contains more than 50% of your daily recommended intake of Vitamin C as well as Vitamins B1, B6, B3, folate, biotin, zinc, copper, magnesium and potassium. With only 200 calories and less than 2g of fat per serving, that’s what we call it a “superfood” salad. By eating less wheat. Refined grain products get digested quickly, which can lead to a large spike in blood sugar, followed by an even larger drop, making you hungrier, faster. Vietnamese food is almost always naturally gluten-free, as many of the dishes are made with rice noodles, rice papers and rice flour instead of wheat. A small amount of Vietnamese food is made with soy sauce, but even that can be substituted with a gluten-free option. With restorative herbs like coriander and mint. Not only are most Vietnamese dishes flavoured with fresh herbs, but each bowl of authentic pho comes with a massive side plate of herbs to add to your soup as you wish. On every classic pho herb plate, you’ll find coriander and fresh mint – two herbs that are known to promote healthy functioning of the liver as well as relief from indigestion and nausea (and headaches!). fries or bun noodles (packed with lean protein and plenty of veggies) will double the pleasure. Health experts warned us that sugar is just as dangerous as alcohol and tobacco. Many Vietnamese soups and starters like fresh spring and summer rolls are low in sugar (less than 5g per serving). 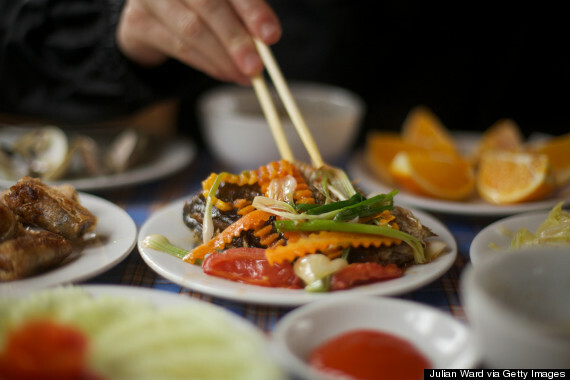 Eating Vietnamese food often will certainly help cut the intake of sugar each week. By cutting calories and eating less fat. Because Vietnamese food is flavoured with herbs and spices (instead of oil or dairy) and is packed full of fresh fruit and vegetables, most authentic dishes, dressings and sauces you’ll find in restaurants are low in calories and fat. Giant bowls of pho noodle soups have between 300 and 600 calories each, and less than 3g of fat per serving, which means you could eat one every day for lunch or dinner as part of a calorie controlled, low-fat diet.